Rookie tight end Adam Shaheen had two excellent games while disappointing veteran Dion Sims was out with injury. When Sims came back, coaches promised Shaheen would continue his increased role. We’re 0/2 on that so far. Shaheen has slid right back into his 3rd TE role, behind Sims and Daniel Brown. The Bears were 3-8 entering this game, so playing a mediocre veteran over a promising (and highly drafted rookie) is indefensible, but it’s par for the course for this coaching staff. Only 4 more games until we’re rid of their ridiculous incompetence. It was not a good day for the offensive line for the 3rd time in 4 games since the bye. They failed to open holes in the running game and could not sustain adequate protection in the passing game. The unit has taken a significant step back this season after firing their offensive line coach and hiring Jeremiah Washburn this year. Speaking of the offensive line, right guard Kyle Long left with a shoulder injury, adding to his list of problems (finger, ankle). He should probably be shut down for the season at this point. Kyle Fuller returned to his pre-bye form today with a number of excellent coverage plays and big hits in run defense. He even snagged his first interception of the year (and just missed on another one). Fuller is one free agent the Bears should look to re-sign this offseason, at least if the price tag isn’t too high. Chicago’s defense is incredibly banged up right now, and it showed today. The injuries at OLB meant that they could not muster a consistent pass rush, and the LB and S injuries exposed far too many holes in coverage. To the credit, the defense was able to stiffen time after time in the red zone, but San Francisco moved the ball pretty much at will between the 20s. To their credit, the run defense had a very solid day. But San Francisco did pretty much whatever they wanted through the air. Chicago had three safeties out with injury today, and a fourth-Deiondre Hall-who was just activated from IR. As a result, Chris Prosinski-who they just signed off of the street this week-got the start and played the majority of snaps. That helps explain some of the holes the 49ers repeatedly found over the middle of the field. San Francisco’s offensive personnel is just as bad as Chicago’s, yet they repeatedly found a way to scheme players open. 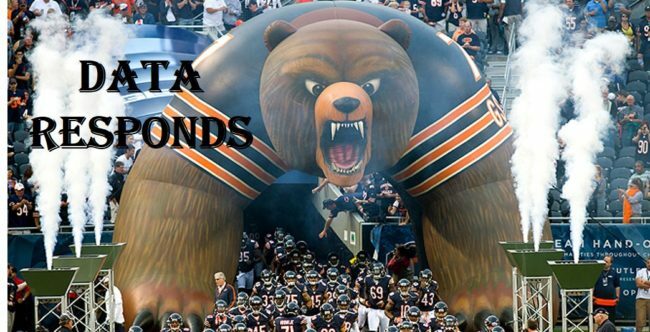 This game fully displayed the importance of good coaching, which the Bears are sorely missing. Defensive lineman Akiem Hicks is not making nearly as many plays as he did earlier in the year. He is clearly worn down and banged up after playing too many snaps for too long. Electric rookie Tarik Cohen had one of the wildest NO NO NO NO YES plays I’ve ever seen. He caught a punt and proceeded to run nearly 20 yards backwards before managing to turn upfield and return it for a touchdown. It was a fantastic play, but please don’t do it again. Cohen has also learned how to take a knee in the end zone on kickoff returns, and he had another big punt return that was called back by a (highly questionable) penalty. All in all, it was a day of great progress for him as a return man that shows how he can impact a game in several ways.